Former Detroit Free Press copy editor, O Street opinion columnist, and former cab driver Oneita Jackson! 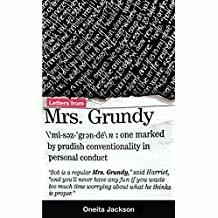 is happy to announce the second edition launch of her DAVE EGGERS-endorsed book, "Letters from Mrs. Grundy" (Antigravity, $12.55). A timely book in light of the recent appalling incidents of customer service happening all across the United States. On sale at the Boston Tea Room in Ferndale.